I love being creative when it comes to making my own products, but did you know that just 6 nontoxic cleansers can clean your whole house? Yep! SIX ingredients. Now, let me tell you why that’s amazing for a second. One. Have you looked at the labels of some of your cleaning supplies lately? Can you even pronounce or remotely understand what those chemicals are? Me neither. Two. Have you noticed that you somehow need like 15 different products to clean your house? Like window cleaner, toilet cleaner, wood polish, dusting spray, stain remover etc? I certainly have. Three. Have you noticed how expensive these poisonous products cost? Like an arm and a leg! It’s CRAZY! And it makes me really upset that all of these things are even allowed near our homes at all. They’re filled with terrible chemicals and covered with poison control warnings. No Bueno in my book. So how do we get around this? Well, there are some pretty awesome ingredients in your kitchen I’m almost positive most people have on hand….and guess what? They work really well! In light of going green and striving for a nontoxic home, I have chosen to try my best to eliminate the nasty chemicals not only for my personal health and the health of the environment but also to get clearer skin, because nasty chemicals = messed up hormones = hormonal acne= really grumpy Tash. I don’t want acne dang it! And neither do you I’m sure. So to get back to the point, I am choosing to use or make plant-derived, biodegradable, gentle nontoxic cleansers for home and body using as few ingredients as possible…like the 6 mentioned below. They’re really all you need. I use baking soda when I’ve got grim, scum, and gook to scrub. I like to use it with steel wool to shine the kitchen and bathroom sink or when the bathtub and shower doors need some TLC. I reserve the baking soda when some grit is needed with that elbow grease, and let me just say, it works like a charm. This is such a wonderful soap! You can literally use it for everything. Lemons are wonderful for deodorizing kitchen sinks, garbage disposals, and cutting boards. You can even use them to shine faucets, the bottoms of copper pots and pans, and even use the peels for polishing wood. My favorite way to use lemons is to slice one up, throw it a kettle with water, and watch as it removes mineral buildup as the water boils. Vinegar is such a superhero! You can clean any almost surface with diluted vinegar to cut through grease, stains, and even remove odors. It also disinfects everything you put it on. My own grandparents still use it for everything…they know what’s up. To use vinegar for cleaning simply mix 1 part spring water with 1 part white vinegar. Store in a spray bottle and use it to clean all areas of the kitchen and bathroom from the floor to the ceiling. You can even use it to clean windows! If you want to cover up the vinegar smell (which only lasts a few minutes after use btw) feel free to add 10 drops of your favorite essential oil like lavender, rosemary, lemon, or tea tree. I mix them all for a four thieves kitchen spray. This article has a great collection of vinegar recipes to try! 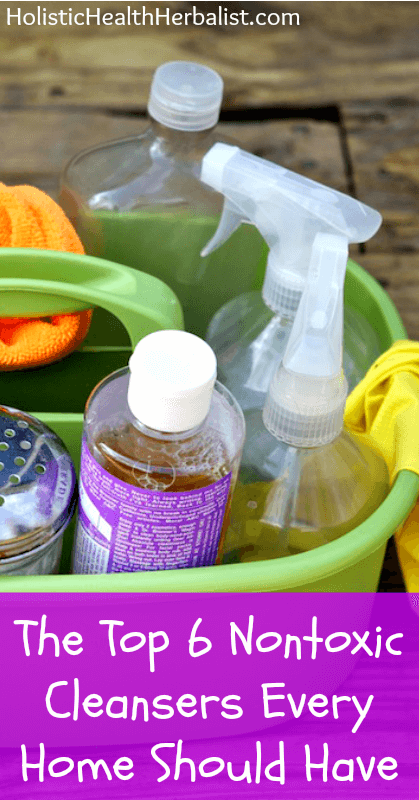 All essential oils are incredibly antiseptic, anti-fungal, antiviral, and antibacterial so it makes sense to include them in your cleaning arsenal. Considered to be the natural bleach, use it for whitening whites, cleaning toilets, baths, and showers, and to disinfect surfaces. I also love using it to naturally whiten my teeth, treat ear infections, and as a wash for cuts and scrapes. Do you use natural nontoxic cleansers for your home?